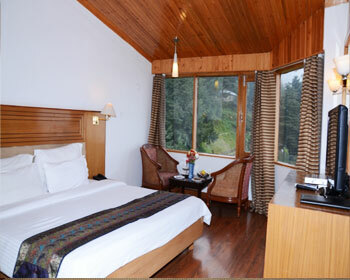 Located in Kufri, Kufri Holiday Resort offers spectacular views in the peaceful quiet environment. The resort is situated in the Himalayan mountain ranges that is built with local Himachali architecture and is spread over a large acres of land with a backdrop of snow capped mountains and deciduous forests. The resort welcomes guests from all over the world to experience the unique hospitality offered along with personalized services and modern facilities. Modern facilities offered by the resort includes a well stocked bar, multi cuisine restaurant, a gift shop that features a wide range of collectables, a travel desk that organizes various picnics for the guests, water rafting at Tattapani, golf court at Naldera’s nine hole golf course, fishing at Pabbar River, skiing, various indoor as we as outdoor games, 24 hour room services, in room dining facility and much more. 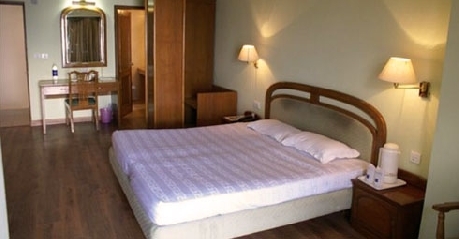 The resort offers 10 standard rooms that are located in the main block of the resort. 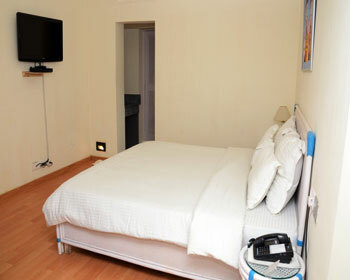 The room occupies an area of 154sq feet and offers a large double bed, separate work desk and two chairs, 38.5 sq foot private bathroom with running hot/cold water, TV with cable connection, a dressing table, luggage rack for extra storing space, electric kettle, in room tea/coffee maker, chargeable extra bed, heat pillars, 24 hour room service, direct calling facility and all day in room dining facility. 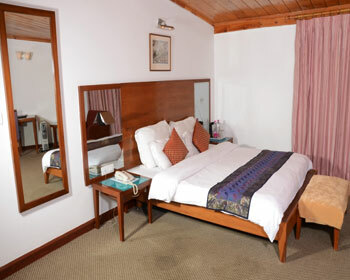 The resort offers 11 deluxe rooms that occupy a space of 154sq feet and are located in the main block of the resort. 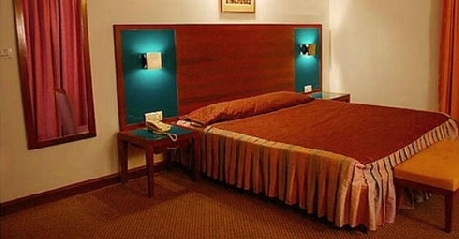 The room offers a comfortable double bed, a separate sitting area in the room, color TV with cable connection, dressing table, 24 hour room service, luggage rack for extra storing space, a large wardrobe, electric kettle, in room tea/coffee maker, heat pillars, in room dining facility, chargeable extra bed, 72sq foot private bathroom with running hot/cold water and a separate 253 sq feet living room with a sofa set. 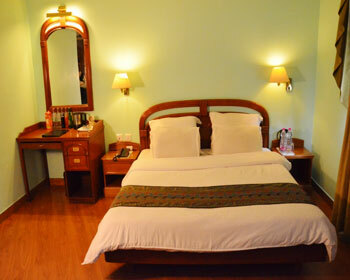 The resort offers 8 deluxe rooms that occupy a space of 224.5 sq feet and are located in the Kuber block of the resort. 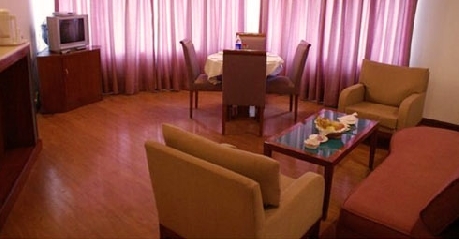 The room offers a large double bed, a separate sitting area in the room, in room dining facility, dressing table, 24 hour room service, luggage rack for extra storing space, a large wardrobe, electric kettle, in room tea/coffee maker, color TV with cable connection, heat pillars, chargeable extra bed, 45.5 sq foot private bathroom with running hot/cold water. 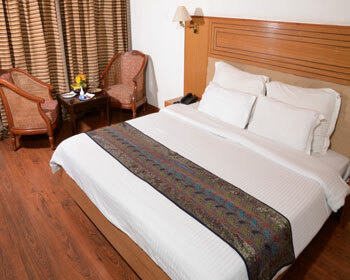 The resort offers 2 luxury suites that occupy a space of 304sq feet and are located in the Kuber block of the resort. 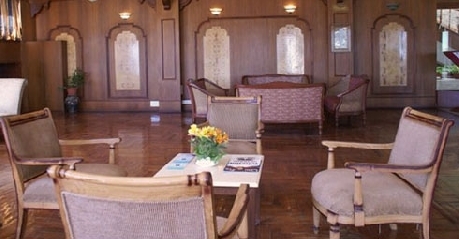 The suite offers a large double bed, a separate sitting area in the room, in room dining facility, dressing table, 24 hour room service, a large wardrobe, electric kettle, in room tea/coffee maker, wooden flooring, color TV with cable connection, luggage rack for extra storing space, heat pillars, chargeable extra bed, 42 sq foot private bathroom with running hot/cold water, 284 sq foot living area with a sofa set and a separate dining area. 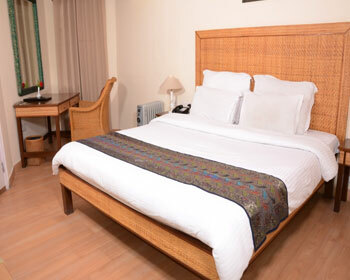 The resort offers 2 royal suites that occupy a space of 312 sq feet and are located in the Kuber block of the resort. The suite features a large double bed, a large wardrobe, electric kettle, in room tea/coffee maker, carpet flooring in the bedroom, color TV with cable connection, a separate sitting area in the room, in room dining facility, dressing table, 24 hour room service, luggage rack for extra storing space, heat pillars, chargeable extra bed, 78sq foot private bathroom with running hot/cold water, 438 sq foot living area with wooden flooring in the living room, a sofa set, a separate dining area, and a 65sq foot private sit out area in the balcony that offers a breath taking view of the snow capped mountains. 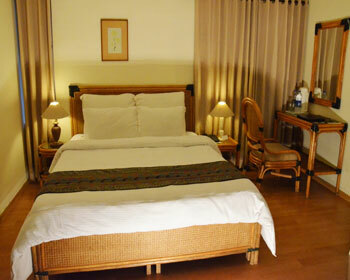 The resort offers 4 two bedroom cottages that occupy a space of 195.5sq foot. These individual properties are located in the cottage block of the hotel and offer 2 bedrooms, a separate living area, exclusive kitchen and attached bathrooms. The bedrooms offers two double beds, LCD TV with cable connection, luggage rack, easy chairs, wardrobes in both the rooms, electric kettle, in room tea/coffee maker, a separate work desk in both rooms, 48 sq foot attached bathrooms with running hot/cold water, heat pillars, direct calling facility, 24 hour room services, 328 sq foot living room that offers a sofa set, separate dining area with a dining table and 4 chairs, in house kitchen with a microwave Owen and a mini fridge, and a private sit out area. 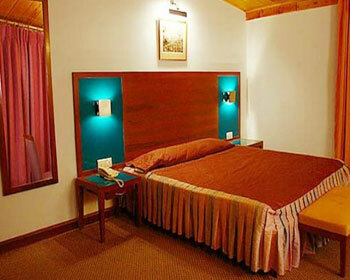 The resort offers 5 one bedroom cottages that occupy a space of 154 sq foot. These individual properties are located in the cottage block of the hotel and offer one bedroom, in house kitchen, and private balcony and attached bathrooms. The bedroom offers a comfortable double bed, LCD TV with cable connection, luggage rack, wardrobes for extra storage space, electric kettle, in room tea/coffee maker, a separate work desk, 554 sq foot attached bathroom with running hot/cold water, heat pillars, direct calling facility, 24 hour room services, 69 sq foot of in house kitchen with a microwave Owen and a mini fridge, a small dining area for two people and a private sit out balcony with a beautiful view. The resort offers 2 studio cottages that occupy a space of 121sq foot. These individual properties are located in the cottage block of the hotel and offer 1 bedroom, a separate living area, exclusive kitchen and attached bathrooms. The bedroom offers a double bed, LCD TV with cable connection, wardrobes in both the rooms, electric kettle, in room tea/coffee maker, a separate work desk in both rooms, 60 sq foot attached bathrooms with running hot/cold water, heat pillars, direct calling facility, 24 hour room services, 168 sq foot living room that offers a sofa set and a small kitchen with microwave and a mini fridge. The resort offers its own restro bar that offers a multi cuisine menu that offers the guests the most exquisite culinary delicacies with a breath taking view if the mountains and green terrains. 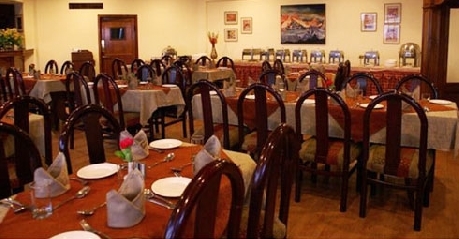 It is open for 3 meals of the day and offers in room dining services.